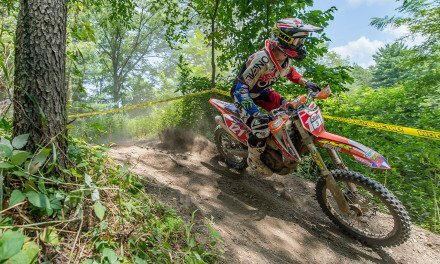 Photo By Shan Moore Ryan Sipes won nine of 12 tests en route to the win at the opening round of the Kenda Full Gas Sprint Enduro in South Carolina. 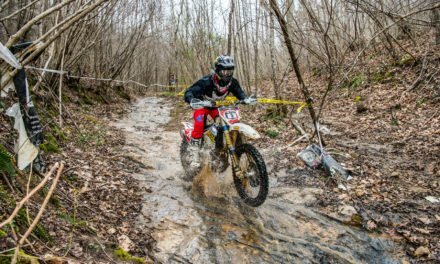 The Kenda Full Gas Sprint Enduro Series presented by PRI Powersports Insurance kicked off its 2017 schedule with the opening round of the season at MotoVated Sports Complex near Gaston, South Carolina, where Coastal Racing’s Ryan Sipes claimed a 32-second victory over SRT Racing’s Steward Baylor. Sipes’ win was his first in the Kenda Full Gas Sprint Enduro Series, however, in his defense, the Kentucky rider has spent the last year dealing with assorted injuries, the most recent – a broken arm – which kept him from competing in last year’s ISDE in Spain. Photo By Shan Moore Steward Baylor battled back and forth with Sipes for the top spot on Saturday, but a crash on Sunday forced the SRT Racing KTM rider to settle for second. The South Carolina race also doubled an ISDE Qualifier, which this year changed back to a series format. The qualifiers give amateur riders from around the country a chance to compete for the right to represent the United States on a club team at this year’s ISDE in France. 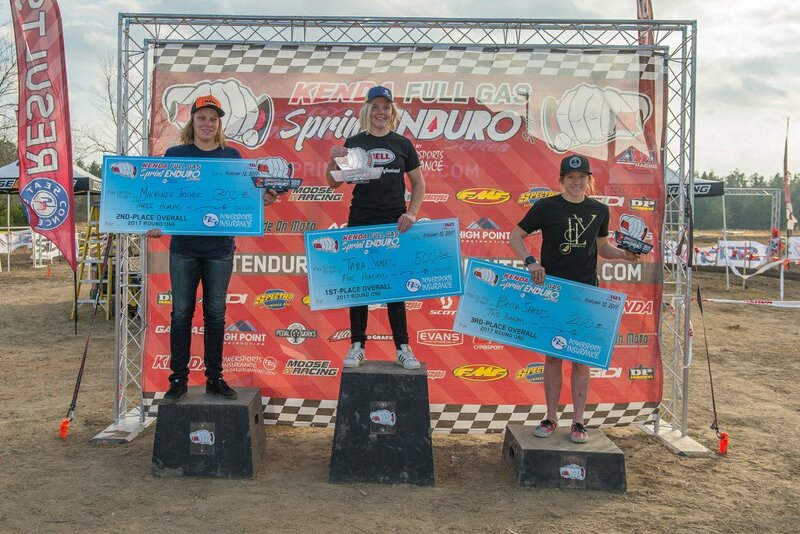 Over 390 riders competed in this weekend’s event, which is a record for the Kenda Full Gas Sprint Enduro Series. Twenty-seven riders signed up as LOI (Letter of Intent) for the weekend, meaning they are competing for ISDE Qualifier points. The top three LOI riders were Ty Tremaine, Jacob Rowland and Brendan Riordan. Though he dominated the competition on Sunday, winning all six tests, Sipes battled tooth and nail with Baylor on Saturday, with Sipes winning each of the three Cross tests, while Baylor won all three of the Enduro tests. After a fierce, back and forth with Baylor, at the end of Day One, Sipes held about a four-second advantage over the South Carolina rider heading into the second day of racing. Photo By Shan Moore Jordan Ashbury came from behind on Sunday to finish third. FMF KTM Factory Off-road’s Russell Bobbitt sat in third at the end of the first day, while Coastal Racing’s Craig DeLong and Beta USA’s Jordan Ashburn sitting fourth and fifth. Determined to pick up the pace in the Enduro tests, Sipes spent most of Saturday evening walking the Enduro tests, checking out the lines and burning them into his memory. All the walking paid off, as the Husqvarna rider dominated Sunday’s competition, winning all six tests. Meanwhile Baylor finished second in each of the tests except for the fifth test, where he crashed heavily and nearly ripped off his radiator. After two days of racing, Sipes picked up 28 seconds on Baylor on Sunday to claim the overall win by a comfortable 32-second margin. Photo By Shan Moore Russell Bobbitt was in the hunt for test wins on Saturday, however the FMF KTM Factory rider struggled with the course on Sunday and finished fourth. Ashburn was 17 seconds behind Bobbitt heading into Sunday’s event, and the Beta rider was able to find his form and make up considerable ground heading into the final test. Ashburn was just under four seconds behind Bobbitt with just the Cross test remaining and the Beta rider was able to make up the distance to steal third overall from Bobbitt. Bobbitt finished a strong fourth for the weekend, admitting he struggled during Sunday’s event. Cory Buttrick started strong on Saturday, finishing third in the opening test. However, a broken rear brake pedal in the second test put the SRT Racing KTM rider in a hole he would spend the rest of the weekend trying to dig out of. The Ohio rider was able to climb from outside the top 10 on Saturday to fifth overall by the end of Sunday’s event. Photo By Shan Moore Cory Buttrick was third in the first test but broke his rear brake pedal in the second test and lost considerable time. The SRT KTM rider finished fifth. Jesper Borjesson came all the way from Sweden to finish sixth. The KR4 Husqvarna rider competed in one of last year’s events as sort of a trial run and has decided to return for the entire series in 2017 with the help of KR4 Arrive-n-Ride. N-FAB/Am Pro Yamaha’s Ricky Russell came on strong in Sunday to secure seventh overall, beating out Colorado’s Ian Blythe by just under 10 seconds. 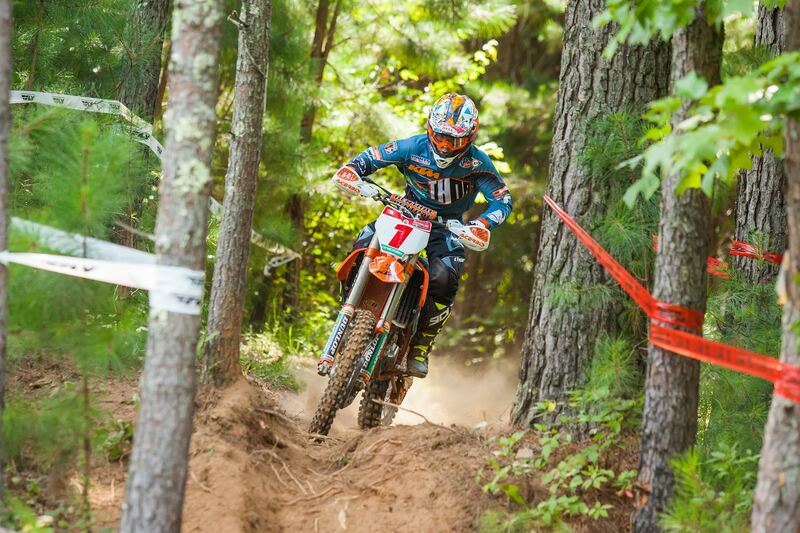 Meanwhile, Coastal Racing’s Craig DeLong and Solid Performance KTM’s Jesse Groemm rounded out the top 10. Photo By Shan Moore KR4 Arrive-n-Ride Husqvarna rider Tayla Jones beat fellow Aussie Mackenzie Tricker for the Women’s Pro division overall win. The Women’s Pro division was a battle between fellow Australian’s Tayla Jones and Mackenzie Tricker. The two Aussies grew up competing against each other when they were kids and now, 10 years later, they are battling again for the Women’s Pro championship in the Full Gas Sprint Enduro Series. Tricker held the upper hand after Saturday’s event, but Jones, who helped lead the Australian Women’s team to an ISDE victory last year, was able to make a comeback on Sunday and take the win by eight seconds over Tricker. KTM’s Becca Sheets was third overall. Billy Schlag topped the Open A division with an overall time of 1:16:19.075, while Cole Mattison won the Lites A division with a time of 1:16:08.960. Mattison was also the top Amateur rider. The Junior classes are the future of any series, and the South Carolina race featured some intense racing among the 41 youth riders signed. Zachary Davidson, Seth Stevens, and Dillon Zimpel came away with the top three positions in the Junior classes, with Davidson finishing the two days in 1:23:25.573. Stevens finished the event in 1:24:41.498, with Zimpel finishing in 1:24:41.266. 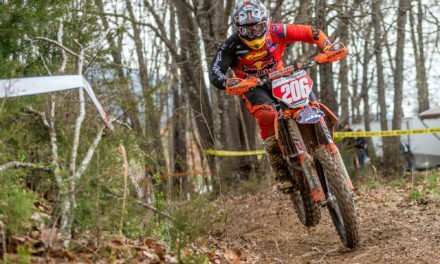 The Kenda Full Gas Sprint Enduro Series presented by PRI Powersports Insurance resumes action at Echeconnee MX in Lizella, Georgia on February 25 and 26. For more information go to https://www.sprintenduro.com.